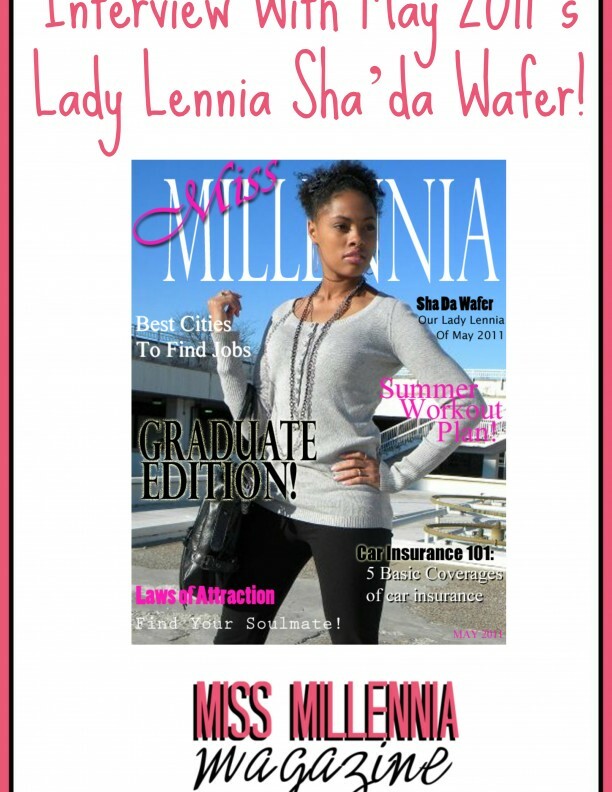 Interview With May 2011’s Lady Lennia Sha’da Wafer! Sha’da Wafer opens up about her struggles starting out and how she overcame them through all the odds. A true inspiration, Sha’da gives insight on what she loves and what and where she draws her amazing motivation from. She explains on how she can be and is a Lady Lennia we can truly admire! Since graduation and immediately prior to graduation my biggest struggle came during the time of transition from home and a relationship. I moved to Cleveland, Ohio for an internship. When I got there I did not have a stable place to live yet and the financial aid department decided to randomly investigate my application which put me in a very difficult financial strain. So in result I stayed in a hotel room until I found an apartment all while trying to stay motivated and excited about my internship and to do a great job representing not only my university but myself as a potential employee of this company. In the meantime I was engaged to a man whom I had been with for two and a half years and went through so many good and scary times with that eventually we wanted two totally different things out of life. It was at that time and prior to that moment I actually felt the Lord leading me astray and into His will which meant I needed to leave that life behind even though it would confuse and frustrate so many people…myself included. So needless to say that relationship ended in the midst of struggling in a new city with zero family and very minimal money and resources and friends that just could not provide the support that I needed with the exception from one woman who became a blessing to me. A piece of advice that was given to me was to “be ready for God to move, because once He moves He moves fast” …the truest statement I’ve ever heard. Nature is one thing that truly inspires me. I love to watch God’s creation. It’s so beautiful and a constant reminder of how awesome God is. Everything from sunsets and flowers to the animals in the world to intangible creation such as love and beauty that you can see from the inside out in people. These things inspire me to enjoy my life just the way it is and welcome whatever God has for me, to stay open and not become so closed minded and negative anymore about life’s circumstances and pain, because I serve the creature of all these things we see and experience in nature. I definitely believe I can inspire women in this age range, because I myself am in this age range, and we experience many of the same things when it comes to things people expect from us. I believe that my life circumstances and challenges have given me the opportunity to develop thicker skin when life happens to me, and I believe many women can benefit from the knowledge and encouragement that I have gained as a result from my challenges and how I overcame and am overcoming daily. From my understanding Miss Millennia is a woman who understands how to live in today’s day and age without becoming a victim of the endless negative influences that society, media, and culture presents daily. Instead this woman is inspirational, positive, poised, an overcomer, diligently pursuing success in every area of her life, a woman of virtues and class. She represents strength, empowerment, and femininity. From the outside this woman may seem intimidating, but because she is so humbled and beautiful on the inside she is at the same time extremely approachable and sought out for advice, support, nurturing, to be a listening ear, friendship, employment, relationships, and encouragement. She is a woman in ever sense of the word.